BIRTHDAY CAME EARLY THIS YEAR! Thank you Mitch & Una. 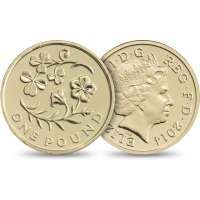 Completing the FLORAL £1 of all four constituent of United Kingdom and these were specially minted to celebrate 30th year of £1 coin since it was first introduced in 1983. The first two were minted in 2013. 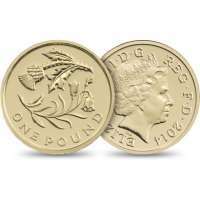 In 2014 UK £1 Brilliant Uncirculated Two-Coin Set representing Scotland and Northern Ireland was minted and available for sale. 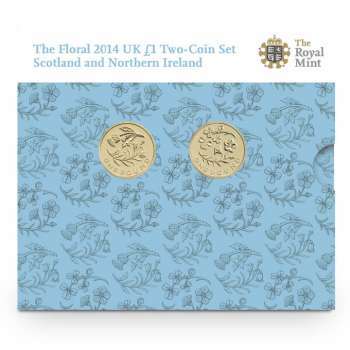 These two are completing a quartet that began in 2013, the coins feature elegant floral-inspired designs by Timothy Noad, which pair the thistle and bluebell for Scotland and the shamrock and flax for Northern Ireland. Latin inscription whose full form is ELIZABETH II DEI GRATIA REGINA FIDEI DEFENSOR, meaning Elizabeth II, by the grace of God, Queen andDefender of the Faith.